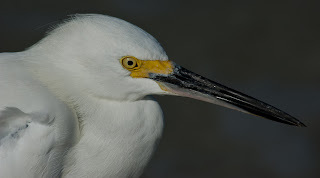 Another shot of a snowy egret taken at Ponce Inlet in Volusia County. These birds hang out by the jetty and are very accustomed to people, especially the fisherman that give them handouts. It's a photographer's paradise although it seems a little too easy to get close to these birds. If you are at all interested in the technical aspects of photography I'll share with you the fact that this photo was taken with a Nikon D1H with all of 2.7 megapixels. I never got on the more pixels are better train and just concentrate on focus, camera stability, low noise and getting in close to the subjects.